Small Animal Talk: How do you deal with stress when you have a stressful job? How do you deal with stress when you have a stressful job? Skye has no trouble amplifying pleasure. 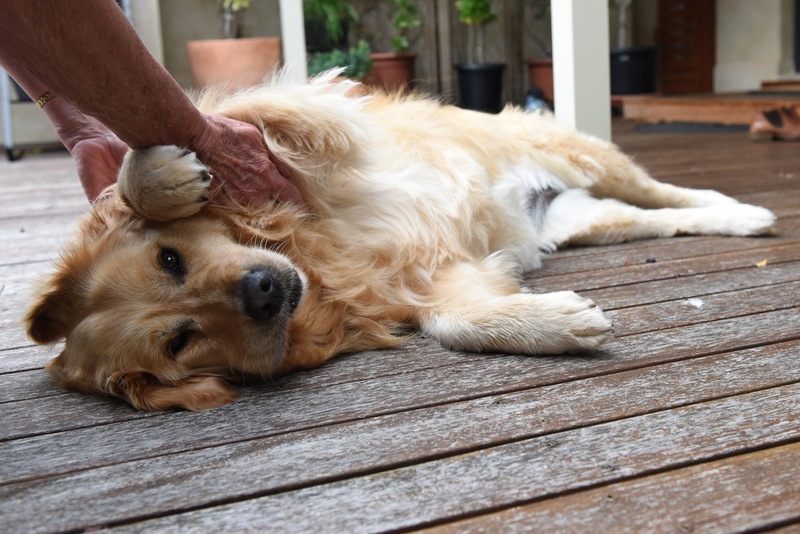 She's pictured having a massage on the deck, getting her relaxed face on. How do you deal with stress when you have a stressful job? It’s a commonly asked question but it was a topic of discussion in a session lead by psychologist Emily Scanlan at the Australian Veterinary Association’s regional conference in Coff’s Habour recently. Dr Scanlan covered a lot of ground but for me there were some standout points. Regarding burnout, “most of us have a bit of it going on.” It is part of being stretched and challenged. Dr Scanlan argued that veterinarians and nurses have made a conscious decision to pursue a meaningful career. Meaning can’t be taken from us, but burnout can be associated with falling out of touch with that meaning. “It steals the zest for living.” Thus burnout is not just the absence of happiness but a bit of an existential crisis, e.g. what is the point? Why am I doing this? It brings a negative bias to thinking, reduces energy levels, limits creative thinking, limits compassion and causes irritability and so on. Getting back in touch with why we do what we do is important in tackling burnout. When we think about animals with behaviour problems, we often address these in terms of biology, training and environment. The same approach can be used with people when we are trying to change our lives. We can work on the biological (getting more sleep, improving nutrition, removing or reducing alcohol intake), environmental (seeking support, reducing working hours) and psychological (challenging types of thinking, working through unprocessed grief). We need to separate our work from our personal selves. As Dr Scanlan said, “You are NOT your job but vets find it difficult to separate work from who they are.” She recommends having some sort of ritual, even if it’s just having a shower and changing clothes (usually not negotiable when you’re a vet coming home from work – at least if you live with other Homo sapiens! ), to delineate the working self from the home self. Pleasure amplification is a skill. Knowing what brings positive feelings and amplifying these is a skill that often needs deliberate cultivation. This reminded me of a conversation I had with a workaholic friend a few weeks ago who was giving herself gradual exposure to unstructured time. It actually takes training to enjoy this time. Dogs and cats seem to be much better at it than we are.